Cluedo, known as Clue in the USA, is a popular board game with a murder mystery theme. The CD-i version makes full use of Digital Video to present the viewer with a challenging game. By interviewing real characters and using a process of deduction the viewers must play against each other to find the murderer, the murder weapon and the murder room, and correctly accuse the culprit. In 1994, 3T Productions developed one of the best games that were ever released on the Philips CD-i (but then it didn't have much competition!). The disc contained 3 mysteries - "The Hooded Madonna", "Happy Ever After" and "Deadly Patent" - in which you could move around the rooms, interview the suspects and try to work out who killed Mr. Boddy. A cut down version of "Deadly Patent" made it onto the PC in the Cluedo CD-Rom Computer Game (released in 1996). There are quite a lot of CD-i game featuring a live cast, like The 7th Guest and Zelda's Adventure. Here the people are pasted in a virtual setting. Cluedo offered a full movie scene, just like the screens of the American laser Games, including Mad Dog McCree and The Last Bounty Hunter. The use of Digital Video is very suitable for a game like Cluedo, and you'll continuously watch for details along the way. In 1996, Hasbro Interactive released their first Cluedo PC CD-Rom game. This was a conversion of the Cluedo CDi and Cluedo : The Mysteries Continue CDi games. Three different mysteries were released - one on each of the 3 CD-Roms. Advertised as having 12 Mysteries; what they actually meant is that there were 3 "episodes" (Deadly Patent, The Road to Damascus, and Blackmail) with 4 skill levels (each having a different solution). Like the CDi originals, this version involved live actors and first- person 3-D views of Arlington Hall; but lost some features - for example the suspect interviews were changed from video clips to just sound samples. Note: "Deadly Patent" is converted from Cluedo CDi. "Road to Damascus" and "Blackmail" are converted from Cluedo : The Mysteries Continue CDi. 3T Productions still exists by the way, one of the few companies who produced CD-i titles. They received various awards for their CD-i titles, most notably the CD-i version of Cluedo was awarded during the "International Cdi Association Awards" in 1993 in the catagory "Best Adult Home Entertainment". This was a Gold Award for "Best use of Technology in a Home Entertainment Title". We'll have a review ready of Cluedo / Clue on CD-i soon! As one of the former CD-i enthusiasts, Terratron was responsible for the dutch CD-i eigenstart portal and the open source activities at Le Monde du CD-i. In 2004, he started the dutch "CD-i Fanclub Nederland" and finally he bundled all his efforts in CD-i in his own CD-i Technical Archive until February 2007. After this month, everything was locked behind a 'coming soon' screen with some updates behind the scene in March. But, in September 2007, the server was cleaned and now everything is gone. Good to see Terratron is still a regular visitor of Interactive Dreams, but unfortunately no words arrive about his CD-i website. Terratron in 2006: "It is indeed a website I was building and filling with hardware related documents. I wasn't ready yet. The repair service is maybe an option. First I have many other things (private things) to do. There will be some service from TerraTron PC Service, but wait, it's all in the pencil." Along with the currently unavailable "CD-i Collective" (The domain name has expired!) we can add this to the list of CD-i projects that are not going to happen, unfortunately. Visit Gamgator2000's CD-i Store here. 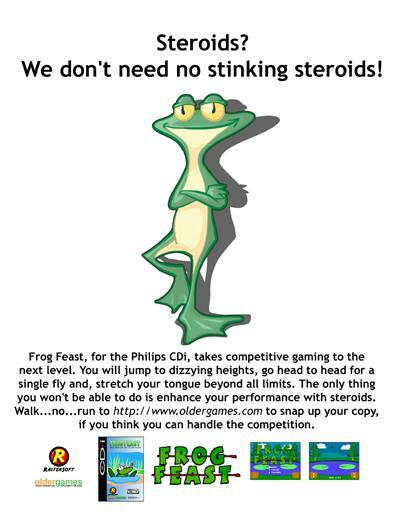 Charles Doty, the programmer of Frog Feast CD-i, is a busy man: Considering lots of new ideas for the future of Rastersoft, while today this advertisement reached our way, promoting the CD-i version even more. Charles: "I'm pondering the future direction of RasterSoft and how to bring some quality games to the CD-I. Developing homebrew games on a non-commercially viable system does has some limitations; we do not have the time or resources to produce a full scale commercial style release. To compensate for this we want to keep the price as low as possible, narrow the focus to produce the highest quality game and, spread the cost over several game systems. I am trying to determine if the Mastertronic model, of producing smaller games at a 'smaller' price, would fit in the homebrew market. I have looked into the possibility of doing a Super Offroad type game, and found some decent material to base the game on. 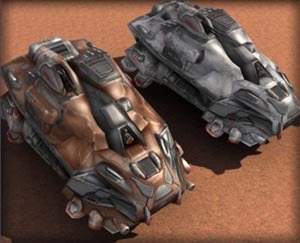 I like the vehicles, I just need to find a good tileset or 3D model for the backgrounds. [At the top] There's an ad I threw together for the Frog Feast game (Scaled down from print resolution): The ad was slightly inspited by Kemco ads from the early 90's." The "Meaning of Life" CD-i Informercial (30 minutes) is here! Once the parade of Captain J's quest on Digital Press, the "Meaning of Life"CD-i Infomercial is the worlds longest CD-i advertising video featuring a guy learning everything about CD-i in 30 minutes. Lots of interesting video spots go by in this one and it's finally available to everyone. in the early 1990's when the philips cd-i came out there was an infomercial that they used to play (remember those middle of the night informercials at 3 in the morning when nothing was on?) late at night for the cd-i. it was about a half hour to an hour and it was just a man (named Phil, obviously short for Philips) sitting in a dark room with a cd-i and a "god" voice talking about the "meaning of life" being the cd-i (which is what insiders call the infomercial). it basically shows him various cd-i titles and convinces him to buy one. I love this game if you hadn't noticed from the Trici Venola Interview! Much like The Apprentice it's full of secrets. One however eludes me and it's that of a missing 8th hotel. Apparently rumor has it that this hotel is accessible only by completing the game in under an hour. Now I'm good but not THAT good! Can anyone confirm this hotel exists? Polas unveils some evidence: "Yes, I'm aware of the rumor of an eighth hotel, as well as the entry on GameFAQs that outlines how to reach it. I have reason to believe it may exist. Number 1, there's a small space on the map screen to the right of Bowser's Hotel where an eighth one could ostensibly fit. Two, the other trick listed on the GameFAQs page does work; there really is a warp zone in 3-5! Going through the ISO files, not one I found on the net but my actual Hotel Mario disc, that's what I found. Unfortunately, my obscure early-90's fringe system hacking skills aren't what they used to be, and I was unable to get any further after a few dead ends. Now, you might say, "Polas! Why don't you just try to beat the game in under an hour?!" To which I would ask you to please press your face firmly against the monitor. If you feel a sharp stinging sensation, my AIM Transfer Slap-o-matic is finally operational. I've done many maddening things in the name of bringing you to corners of gamedom you would otherwise never dare to travel, but even Polas has his limits. Not only is the task itself daunting, but there's no in-game clock that actually informs you if you're beating this damn game in the time required." If anyone figures out how to access the fabled 8th Hotel, or can disprove its existence, by any means, post it here! Here's something interesting. Raleigh Interactive has prototyped several low-cost CD-i kiosk systems in 1995/1996, a time when CD-i was already dropped by most companies. These kiosks were used by Raleigh to promote their own products by means of their own developed CD-i disc in the UK. It was brought to my attention thanks to the Flickr photo-album of 'Dreamtargets'. "Raleigh bikes print and multimedia creative from the late 1990s. Raleigh's low-cost TV and CDi-based interactive point-of-sale units developed by CHC Multimedia, Nottingham, were first rolled out to UK dealers in 1995. At the time, CD mastering and digital video encoding was such a arduous task, that it was necessary to enlist the expertise of a specialist programmer at a facility near Cambridge to have the disks mastered. I preferred the wall mounted prototype for the CDi-based Raleigh Interactive point-of-sale system, but it was the mobile floor standing model that proved most popular and was eventually made available to UK retailers. Both models were used here at Raleigh's annual product launch in Harrogate in 1996." I've only seen the official Philips CD-i kiosks to promote all commercial CD-i titles, but I've never seen these point-of-sale kiosks specifically made by companies accompanying their products. I think Raleigh Interactive did a great job designing these low-cost innovative selling systems, but in the end I don't think it was all a great success :( I'd like that wall model in my home, though ;) The product was developed for their own CD-i called "The 1996 Range" and you can find a lot of pictures from that disc, along with some promotional material of CD-i used by Raleigh, in the link posted above. I hope you enjoy visiting this website just as much as I did creating it! You can already find plenty of cd-i cover art on the 'software' page of this site, but let me make a start with my cd-i story on this main page... Let's start with the beginning: when I got my cd-i machine many years back. To be honest, I don't remember exactly when I got my cd-i machine. But it must have been in the summer of 1995. I happened to find this letter from Philips Netherlands, dated 27 July 1995. Take a look. It confirms our membership of the so-called CD-i Gold Club. If one registered with Philips one received as a gift the cd-i disc Compton's Interactive Encyclopedia for free. We also received the Dutch wordgame and TV Show 'Lingo' as an extra gift. At the time this was a new released cd-i disc, which was given away for free to new buyers of a system to promote the cd-i. The machine I got was the CD-i 450 system. The 'CDI 450 Tutorial Disc' was included in the box. Finally, I also got the Dutch demo disc called 'Alles over cd-i' for free. It was either in the box or it came with the Compton disc. I have forgotten. It was 12 years ago, you know!" More news? Visit "CD-i is Great"! I just found this page, where you can easily browse through all the CD-i covers and titles. It works far more easy than searching for a picture in the image gallery of Le Monde du CD-i. This one goes in the same direction as the index of Philipscdi.com, please make it complete as no-one ever did that! More website news (now we're at it) finally at wednesdays topic Philipscdi.com: "CD-i is still alive! - Many many years after Philips gave up the CD-i and long after their last title was published, it is still obvious that the CD-i community is a very active and resourceful one. Not only the many CD-i related sites prove this, because a couple of weeks ago, a new CD-i game was released. Yes, indeed!" And plus, our own Interactive Dreams is hyped, we can't see that enough!